The Government wants the private sector to build and operate rail services in a US$ 800 million (Rs. 127 billion) project in the Hambantota district, a senior official said yesterday. In terms of the proposal approved by the cabinet, worldwide tenders will be called to construct railroads from Beliatta to Hambantota, Kataragama and the Mattala airport on a Build-Operate and Transfer (BOT) basis, Transport Ministry Secretary G.S. Withanage told the Sunday Times. The company undertaking the project would be required to construct a rail track of nearly 100km, install signalling systems and operate the services within the district, he said. 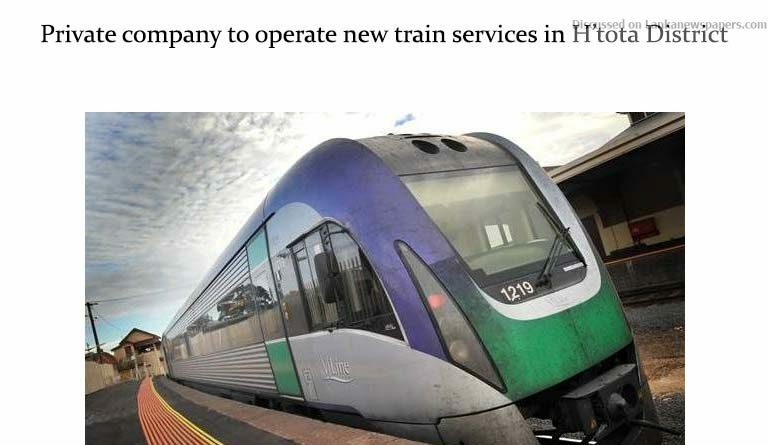 It could decide on the fare to be levied, deploy its own locomotives and carriages for passenger or cargo transportation and levy charges for the state-sector trains entering the area and using the services. In turn, if the company’s locomotives or carriages use Sri Lanka Railway tracks and its services, it would have to pay for it, he explained. The secretary said the company would also be able to carry out commercial activities such as putting up restaurants, cargo storage facilities and shopping complexes in the areas coming under its purview. The Government’s initial estimates show that the project will cost around US$ 800 million, but, it could be higher depending on the quotations. The trains would serve the Hambantota Port, the Mattala airport and Kataragama pilgrims. He said the Government was planning to hand over the operation to a company for about 40 years, after which the government could decide whether it could operate the service on its own.